Where was I? 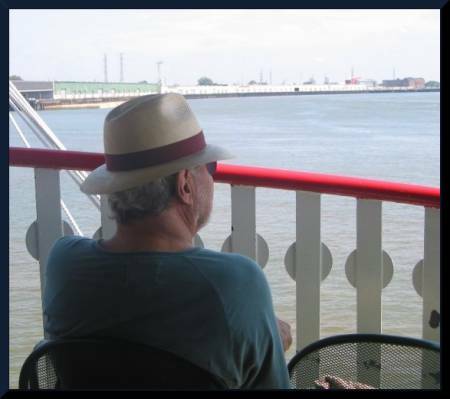 Ah, yes…the Princess took me along for a ride on The Natchez, a big paddle wheeler just like the original ones that carried goods up and down the mighty Mississippi. What a trip that was! The other guy let me use the camera so I took this picture...his better side, if you ask me. 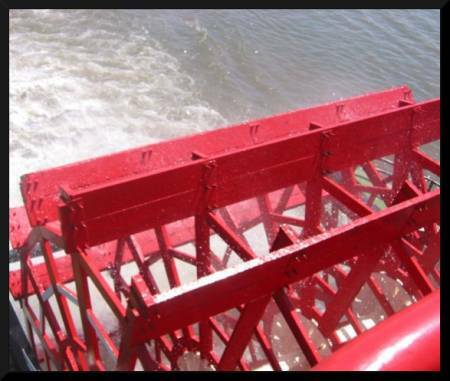 Those red paddlewheels really churn up the water. Big wheel keeps on turning… . Now I can't get that song out of my head! 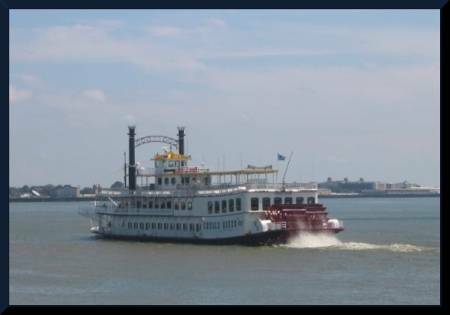 Here's a picture of the Creole Queen...one of the other paddle wheelers. 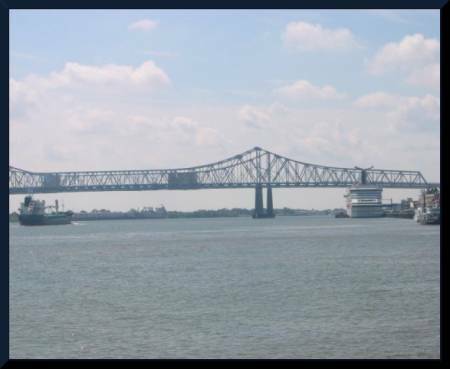 The Natchez is much bigger but they look similar. You should hear the steam whistles blow! There I was, out on that big Mississippi with ships from all over the world. 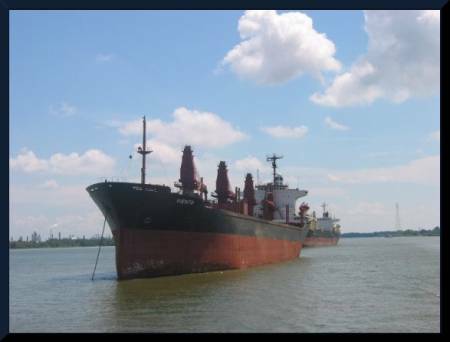 This is one of the busiest rivers in the world! For a moment there I thought I saw the one that brought me to America. Who knows? As I said...it's all a mystery! I was ready to spend 5 cents of my allowance on something to eat, but the Princess told me these signs were no longer accurate where prices were concerned, something about them being over seventy years old. 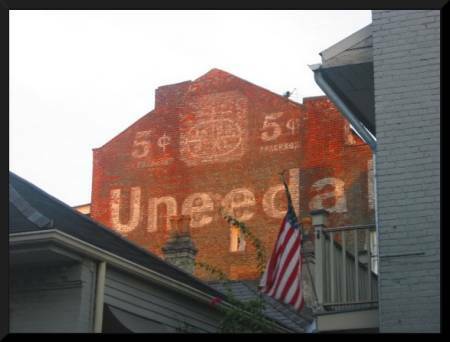 'Uneeda' what? I wondered. She told me it was a cookie, but bought a Po Boy sandwich for me. I saved my 5 cents. 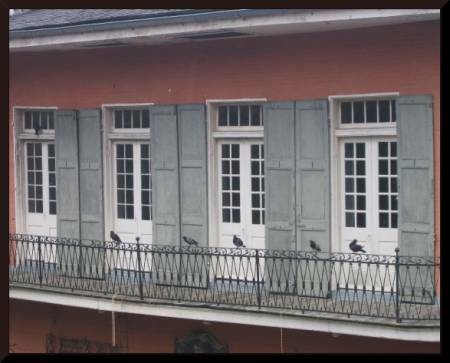 We went back to our hotel and I ate my Po Boy on the balcony while enjoying the colorful view of the second floor of Tortorici's Restaurant across the street. I wonder...does anyone still make pigeon stew? It was time for a nap so I took one. The other guy had plenty to do to get my report done accurately. Oh well, one shouldn't be too critical of lesser talents... .